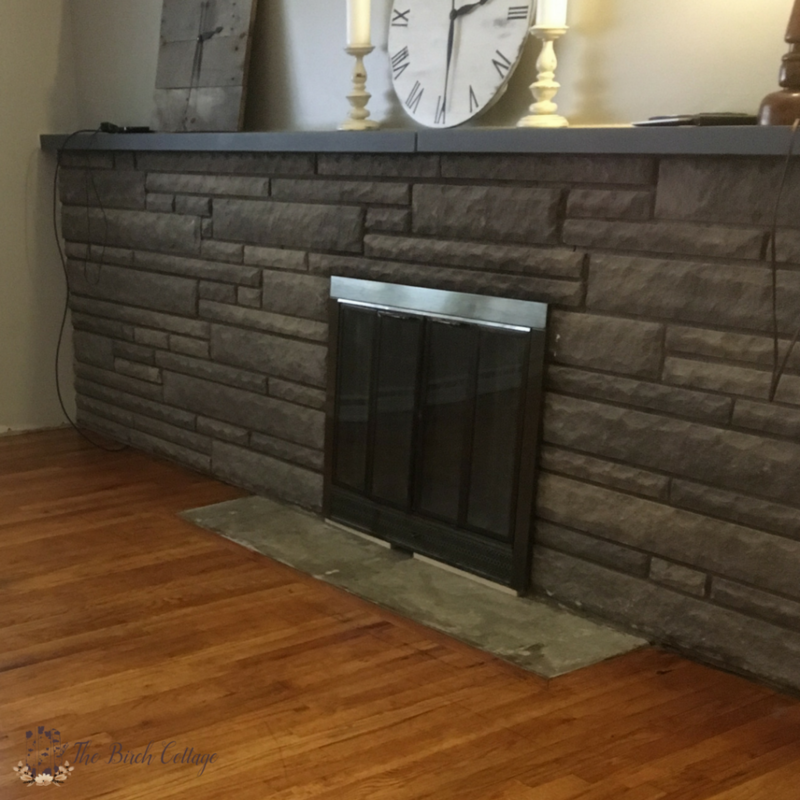 Did you know you can paint a stone fireplace? It’s amazing what a little bit of paint can do for a dull and drab space! I was ecstatic the day my husband said, “You know, if you want to paint the fireplace, I’d be okay with that.” I couldn’t believe my ears! I had actually been researching just how to paint a stone fireplace. But, first, I tried cleaning it. I tried good ol’ Dawn Dish Soap. I tried cleaning the stone fireplace with TSP. I tried scrubbing it with a brush and using Spray Nine. But, nothing got the burn marks and soot stains off the stone as well as I would have liked. If you’re interested in learning how to clean a stone fireplace with TSP, I’d recommend this tutorial from Bob Villa. I found the TSP really did work the best, it was just a messy job! I actually left the TSP on for 30 minutes before rinsing it off. And I did this a couple of times. I’ll share more about that below. I would assume the same technique would work on a brick fireplace. As you may or may not know, we are renovating our house. You can see our bathroom renovation here and read about our son’s bedroom renovation here and our daughter’s bedroom renovation here. We’ve also renovated our bedroom and the hallway. Since completing the bathroom and bedroom area of our house, we moved on to the living room. We are gradually working our way towards the kitchen. Our house was my husband’s childhood home. His parents bought it when he was just a little boy. 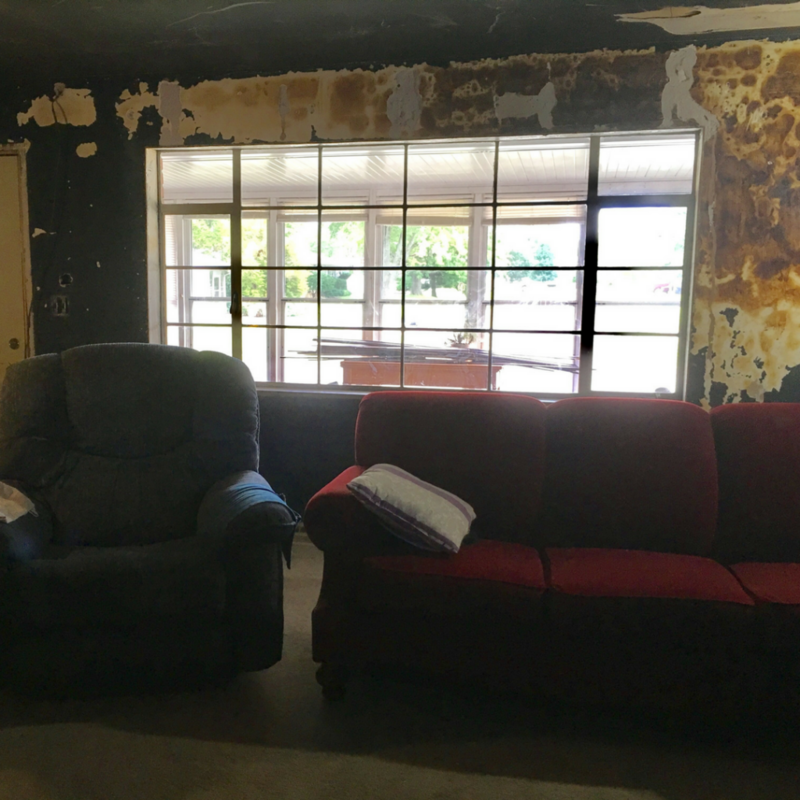 The house had been in a fire and they renovated the house by putting up paneling, drop ceilings and carpet. 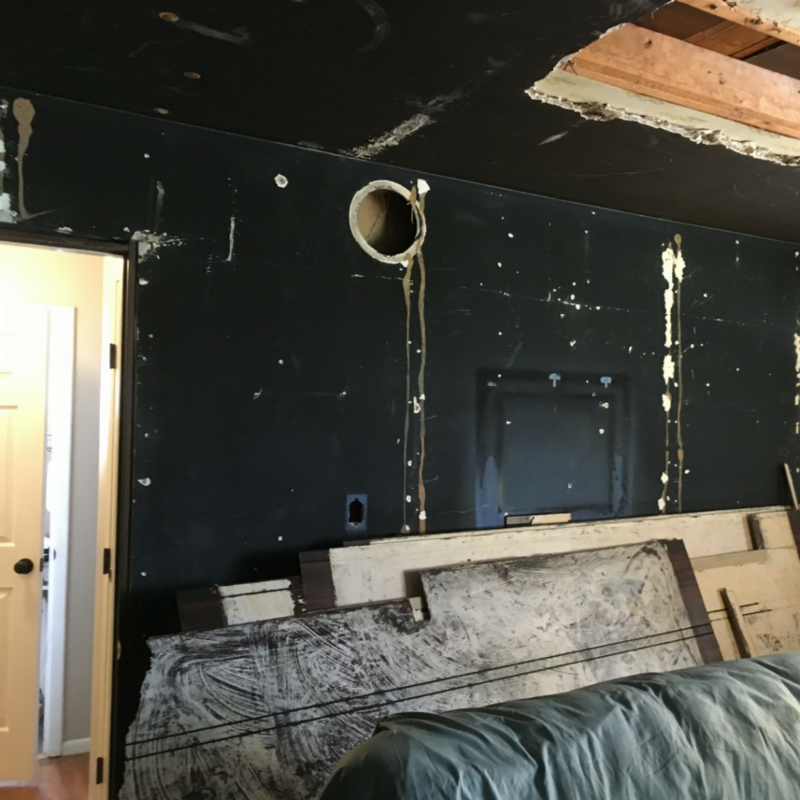 We are renovating the house by removing the drop ceilings, paneling and carpeting. Fortunately, there’s nice hardwood floors underneath all that carpeting. We have refinished the hardwood floors and I think the transformation is just absolutely amazing! But, I’m getting ahead of myself. 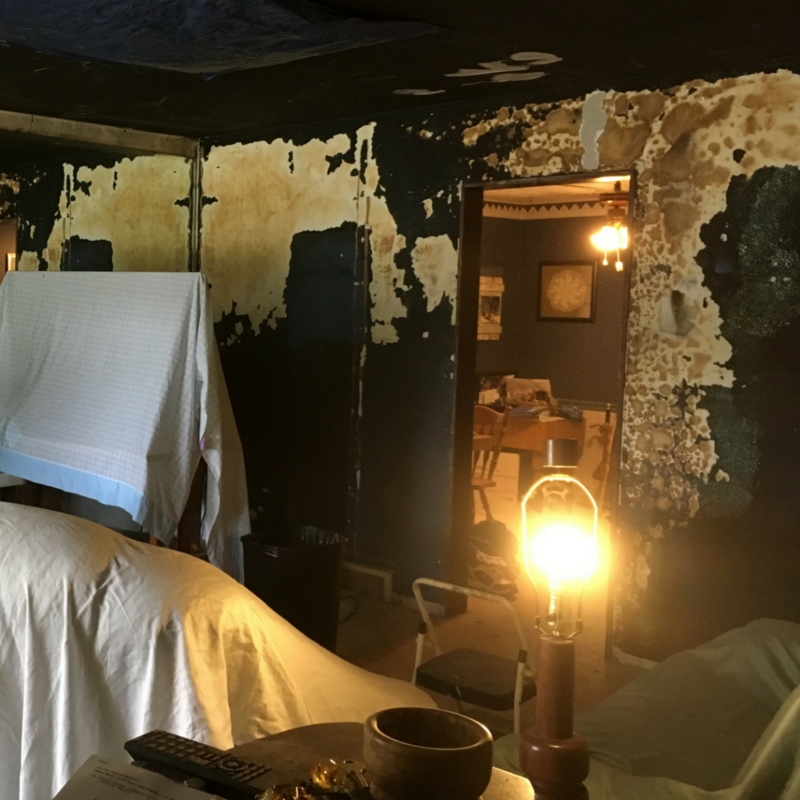 Let’s take a look at my living room before the renovation and before we painted the stone fireplace. Let me take you on a little journey. 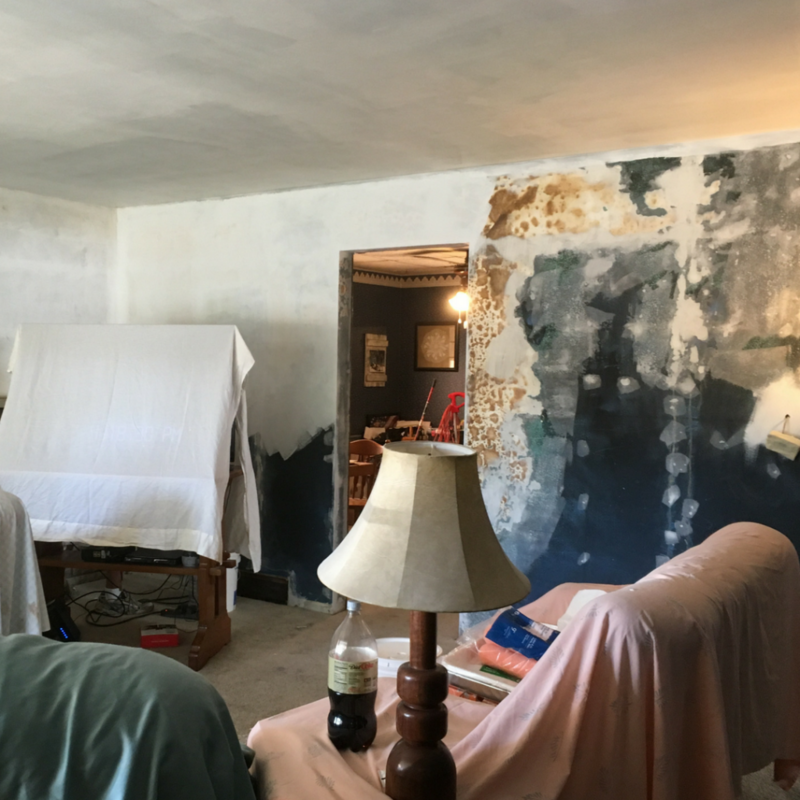 I didn’t take pictures of our living room before we started the renovation. But, just imagine lovely drop ceiling panels, fluorescent lighting and a huge wall of mirrors above the fireplace. In the picture below, you can see the mirrored wall above the fireplace. Those were custom made mirrors for that wall. You can also see the reflection of the rest of our living room in the mirror. Lovely, right? 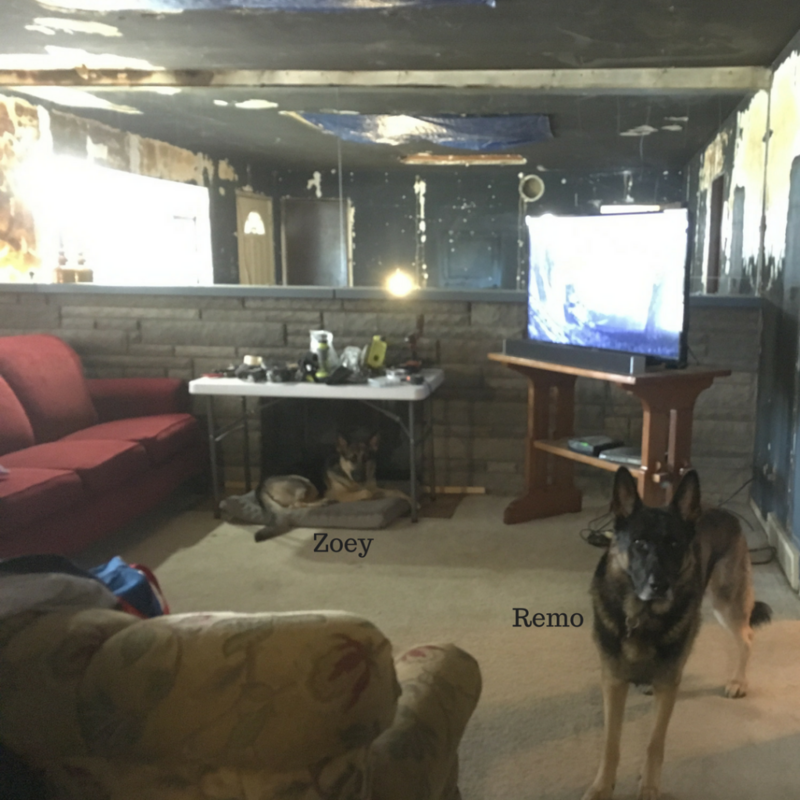 And, I have to point out our two German Shepherd Dogs, Remo and Zoey. They are great photo bombers! We removed the mirrors from the wall. Fortunately, they weren’t actually glued to the wall, but were mounted on sturdy metal brackets – which made removal a lot easier. The white stripes you see on the wall were probably where the original owners had some kind of shelves on the wall. The orange/brown/black colors are actually fire and smoke damage. This is a picture of the wall to the right of the fireplace and that leads into our dining room. You’ll notice that the walls look black. That’s soot and smoke from the fire. See the brown speckles? That’s where the wall was scorched. And, you can see the wallpaper and drop ceiling in the dining room in the background. 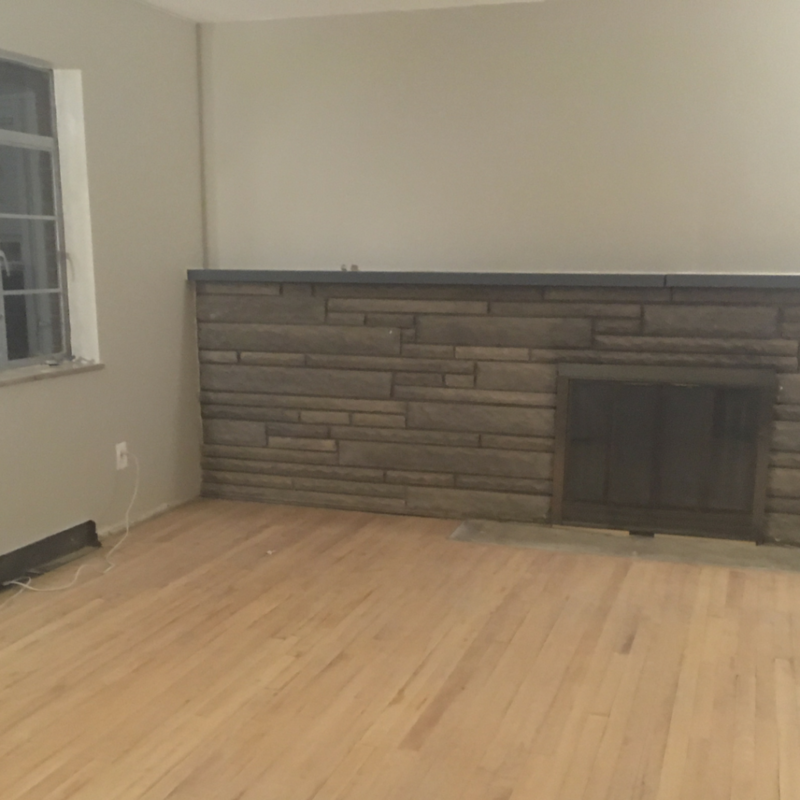 The below picture is the wall directly across from the fireplace. As you come in our front door, this wall is to the right. You can see where the original owners had some artwork hanging on the wall. Again, the black is smoke damage. The round hole in the wall was probably from some sort of whole house sound system. 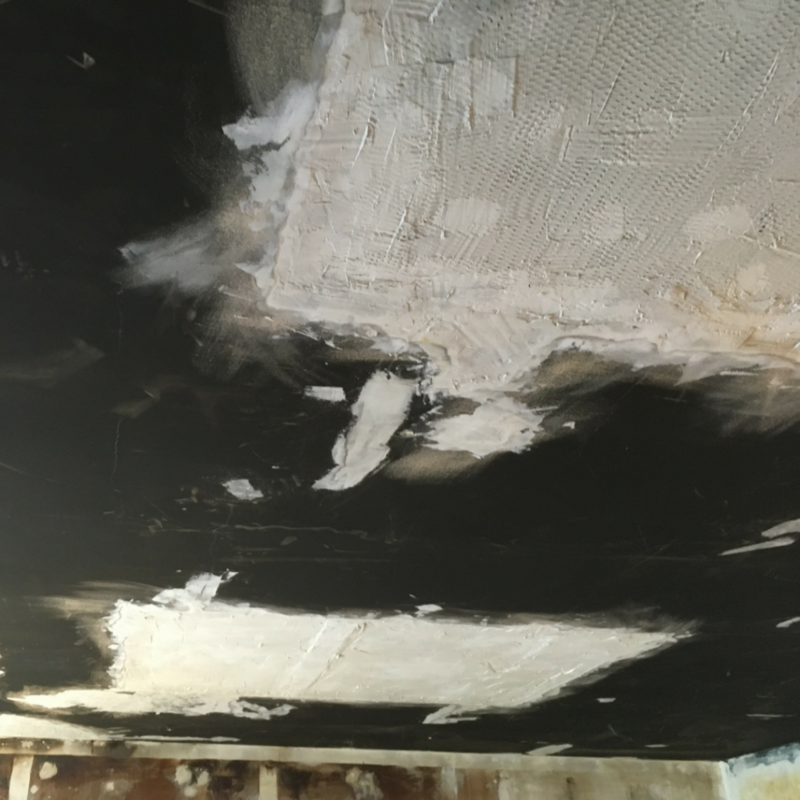 And the hole in the ceiling is from where we removed the lovely fluorescent light fixtures. And this is the view of our front door and linen closet. Did I mention the black is smoke damage? 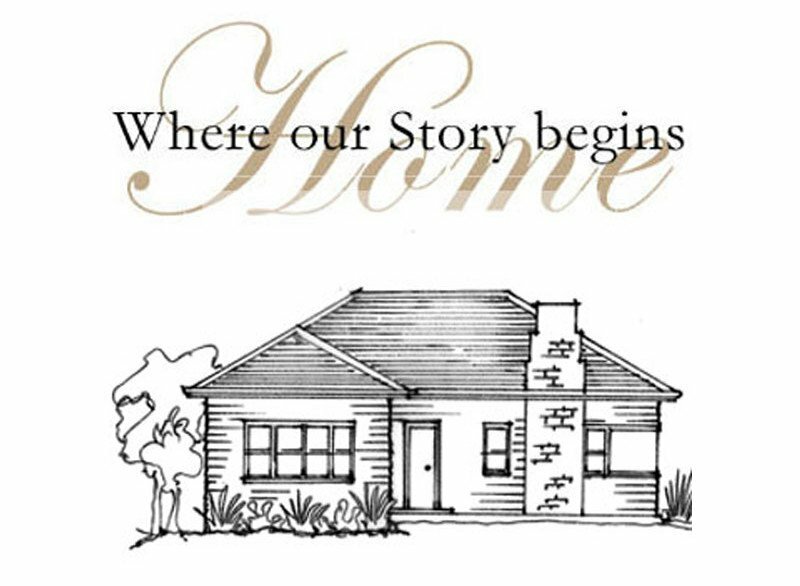 We have a large picture window on the front of our house that actually overlooks our enclosed front porch. That’s also on our “to do” list. The window frame is metal with metal between all the glass panes. The two windows on the side are the type that are supposed to crank open, but they’ve been glued shut. Someday when we win the lottery, we’ll replace that large window. This is a close of up the scorched walls. These were a huge gigantic mess to try to clean. We cleaned them as best (sort of) we could and then used Kilz as our primer before painting the walls and ceiling. Of course, there was lots of patching to be done as well. This was just the first coat of patchwork on the ceiling. When you look at our ceiling now, you can’t even tell there used to be two giant rectangular shaped holes in the ceiling! 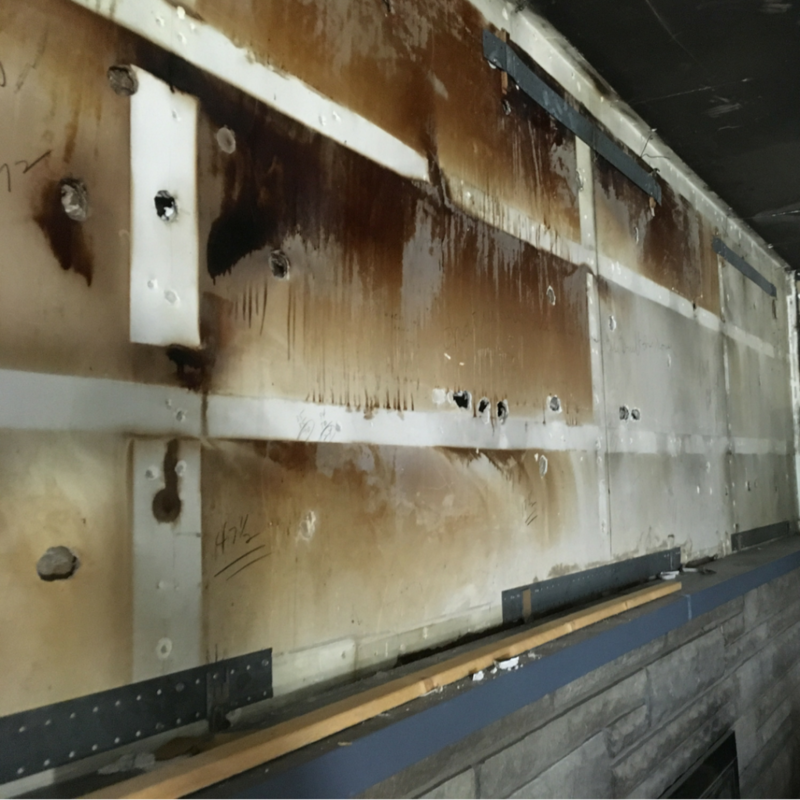 Of course, you also can’t tell that the walls were scorched and soot covered either. 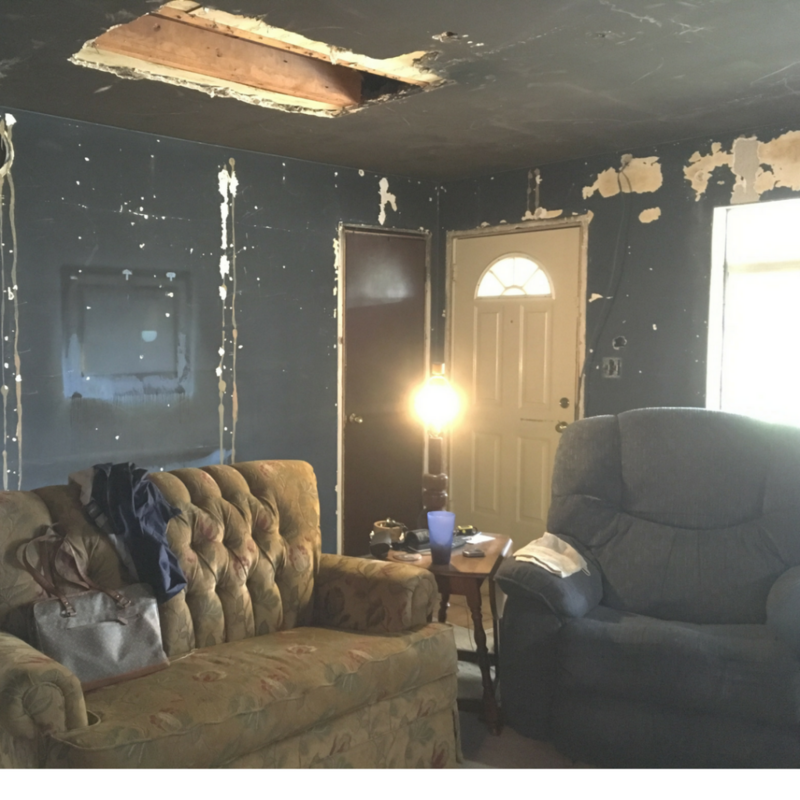 I guess they thought they were doing what was best when they simply covered everything up with paneling and drop ceiling and carpet. We actually left the carpet on the floor until we were ready to tear up the carpeting so that it would catch all the drips and help protect the hardwood floors. 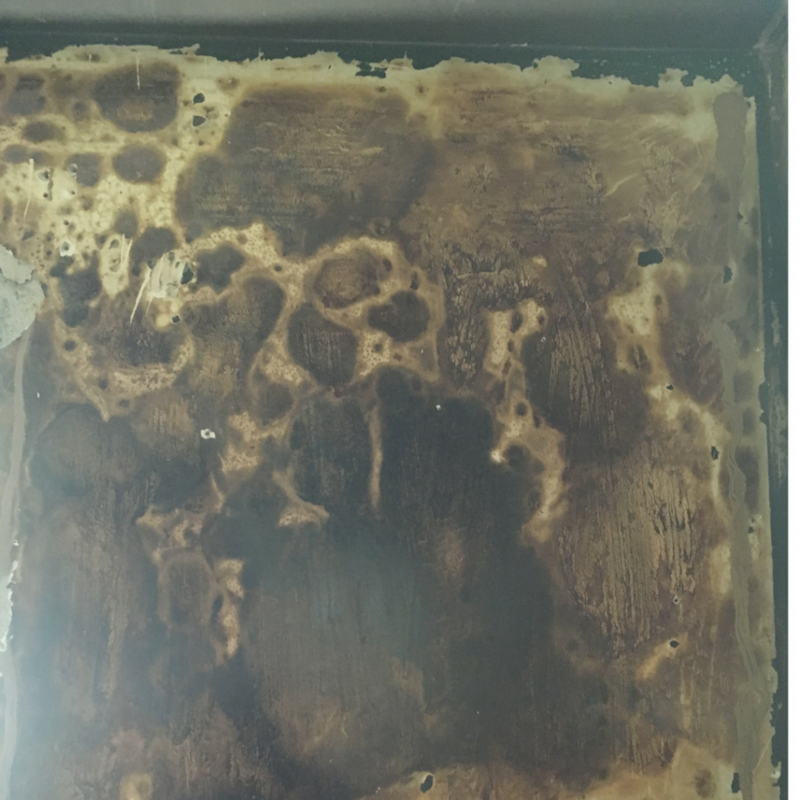 Below is a picture of our fireplace after I cleaned it with TSP. Boy was that a messy job! By the way, we don’t really display two clocks above the mantle. They are just there for safekeeping. In fact, they’re still sitting on the mantle waiting for their forever home. Before you attempt to paint stone or brick, I would highly recommend you clean the surface and allow it plenty of time to dry before attempting to paint the stone. You want as clean a surface to paint over as possible or otherwise you’re just spreading dirt and debris around with your paint. So, clean the stone with TSP, rinse well and allow at least 24 hours to dry. Then I simply took some white paint and diluted it by about 50% with water. Stir well to mix the paint and water. Be sure to mix enough for your entire stone surface or you may have different colors of paint in different areas. You can use a rag or brush to paint the stone. I found a brush worked better. I also started from the top and worked my way down and across the stone. Just keep an eye on the paint as it will run because it is very thin. Use your brush to get in all the nooks and crannies and the caulk lines. Once the white paint dried, I then went over the paint with a very light and very watered down gray paint. I just thought the plain white was too “stark”. I mostly used a stippling type technique to apply the gray paint. Making sure to touch those areas that were raised and then I quickly used a dry rag to sponge up the wet paint. This helped to create a more marbled look instead of a “Pam painted the stone white” look. In the above picture, you’ll see the original stone wall on the bottom right. Then the wall after I painted the stone white in the bottom left picture. 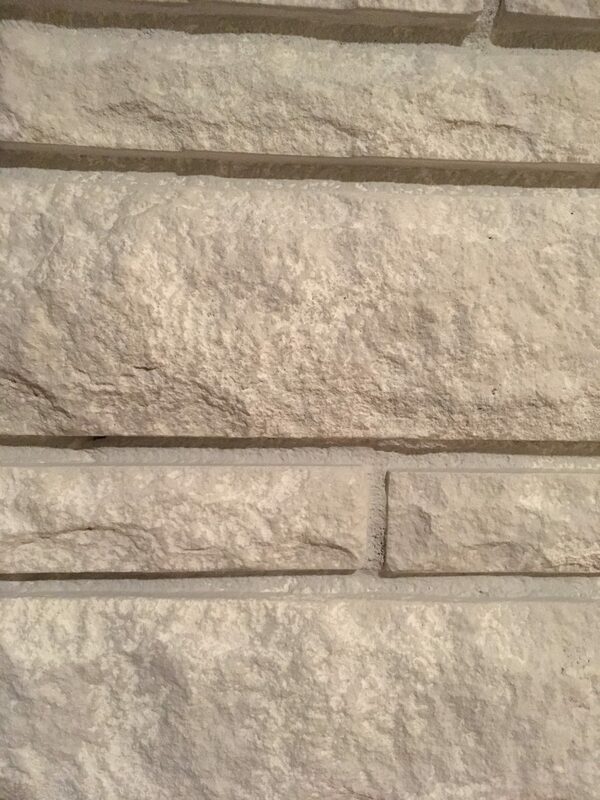 The top picture is a close up of the stone after I added the gray paint. It really helped tone down the stark white stone and add some depth and character to the stone. I love the painted stone fireplace! Since these pictures were taken, we have technically finished our living room renovation. The hardwood floors were refinished and a brand new ceiling fan hung. Now, I still have to decorate and we’re still trying to figure out furniture placement, but as far as the renovation. I think it’s amazing! 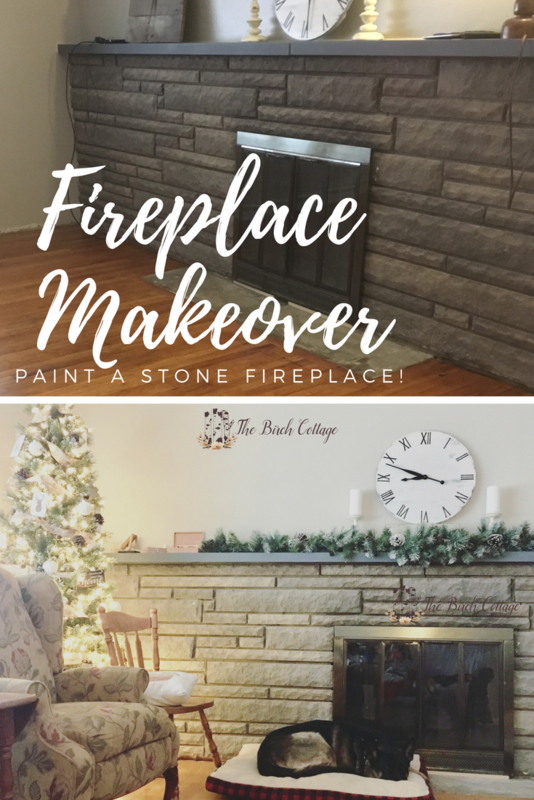 I realize this post is already long, but I thought it might be helpful for you to know what supplies you’ll need, just in case you want to try to paint a stone fireplace! You may already have some of these supplies on hand and you can certainly find most of them at your local home improvement or super store. Please note these are affiliate links to products I have used or recommend for this project. If you click on a link and make a purchase, I may make a small commission at absolutely no additional cost to you! 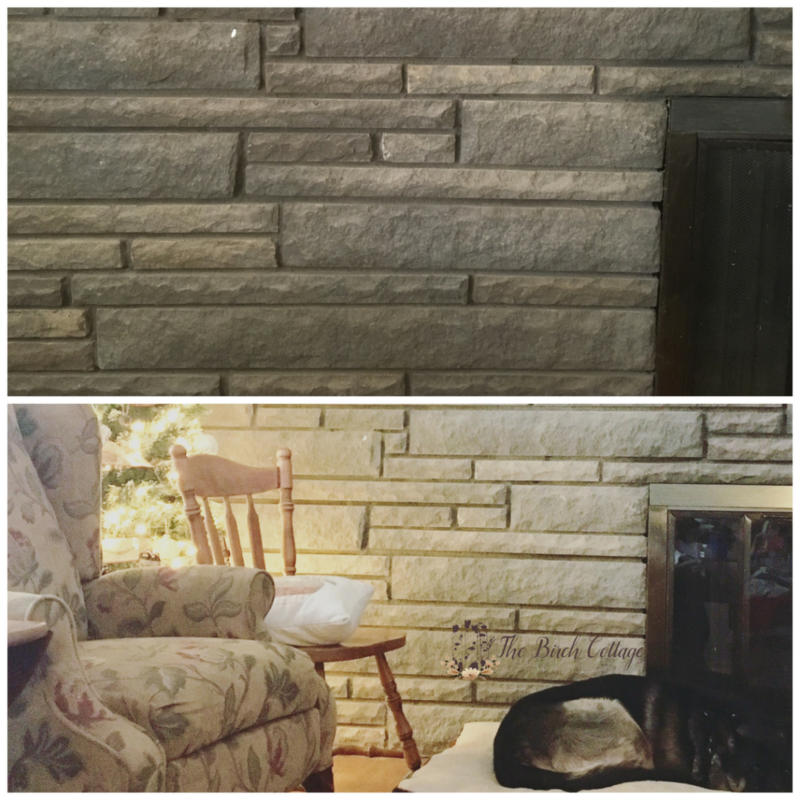 I really was pleasantly surprised when my husband said it was okay with him if I painted the stone fireplace. As I began to paint it, I was kind of terrified. What if I messed it up? I should have researched how to remove paint from stone before I began. I was sure I would love it, if I could just get the color right. First try, it was way to bright white. But, once I added the flannel gray and sort of sponged it on and wiped it off, I began feeling less fearful. Almost a year later and I still love it! 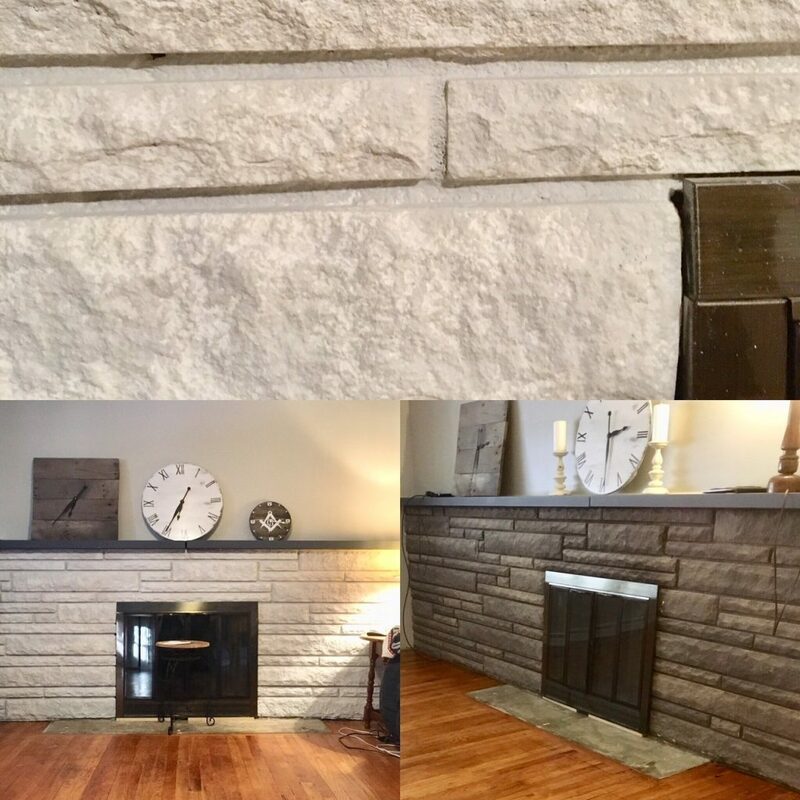 If you have any questions about the technique I used to paint our stone fireplace, feel free to leave a comment below. 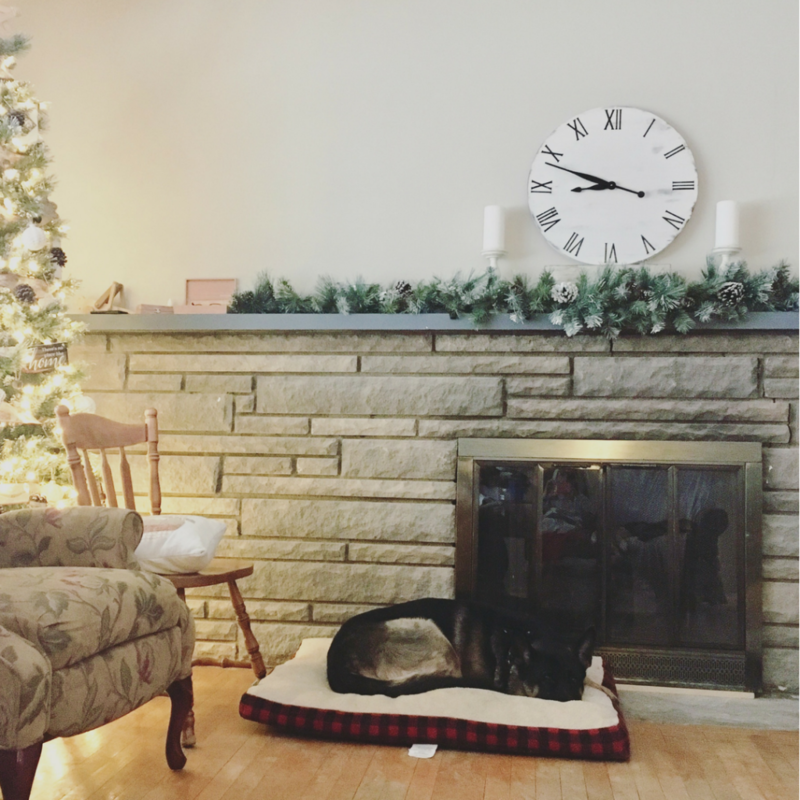 Or if this project inspires you to paint your stone or brick fireplace/wall, I’d love to hear about it!